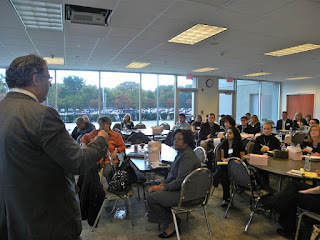 organizations was held on October 19 at Touro Law College. ﻿Earlier this week, I volunteered, along with other social media pros, at Long Island’s Social Media Day of Giving event to offer social media training and advice to non-profit organizations. The event was held at Touro Law College, where I was in the good company of some extremely talented and experienced social media professionals and enterprising non-profit organizations that wanted to understand how they could leverage social media to take their mission forward. While most of the participants understood the benefits of social media, common concerns that resonated among the group were how to create a framework for using social media, how to develop social media policies and get board members and executives ‘on board’ with using these new tools they may not necessarily understand. Based on what was discussed, I’d like to share my own and the collective insights of the group, for the benefit of other non-profit organizations that may be facing the same questions and issues. 1) Before you start a blog, create a Facebook page or Twitter profile, lay out a strategy for being truly social in the social media world. Consider your objective, target audience and how you can best engage them. This will help you choose the best tool for your social media outreach. 2) Plan ahead for what type of content you will post, how much time you will devote, who will be responsible for managing social media and how you will integrate social media into your overall communication plan. 3) Lay down criteria for monitoring and measuring success. 1) A social media policy should roughly define how your organization will participate in online conversations, who will have the authority to speak on behalf of your organization and what key messages you should convey. 2) Define the topics or information that should NOT be shared to maintain confidentiality and legal compliance. 3) Ask that comments on blogs or your Facebook page be respectful and within certain defined parameters (no violent, abusive or racist language etc.) Lay down a policy for dealing with negative comments. 4) Just like IBM and other large organizations, ask employees to use the first person (‘I’ versus ‘we’) so that anything they say in the social media space is representative of their own opinions and not necessarily the opinion of your organization. Tip: Check out the Environmental Defense Fund’s Social Media Policy. 2) Focus on results rather than the tools. Senior board members don’t need to understand the technicalities of Facebook or Twitter though they need to understand what results these tools can achieve. 3) Presenting case studies of similar non-profit organizations who have successfully implemented social media may strengthen your case and add more credibility. 4) Show them the numbers. In rough economic times, low-cost (and even free) social media tools can amplify the reach and effectiveness of your message and help you promote an event/campaign, raise funds, publicize your cause and garner support for your mission. If you have a question or advice on how non-profits can use social media, please feel free to share your thoughts in the comments section. Special Shout-out: Thanks and kudos to Mo Krochmal, a digital journalism and social media specialist, who organized the hugely successful event in collaboration with Prof. Jonathan Ezor, director of the Touro Law Institute Center for Business, Law and Technology. Also to Jeff Namnum and all other volunteers who helped make the event a success. Visit Prism Media to learn more about our social media services. Whose 'Gap' Is It Anyway? Last week, international clothing retailer, Gap, unveiled a new logo that unleashed a firestorm of harsh criticism from customers and fans over the Internet. According to Gap, since they’ve had the same logo for more than 20 years, the company decided to redesign it to make it look more contemporary. 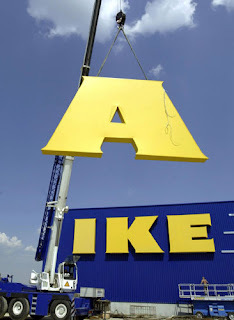 The Gap debacle reminds me of the font furor that ensued last year when home furnishings company, IKEA, changed the font in its logo from Futura to Verdana. Verdana became a trending topic on Twitter as customers from all over the world expressed their disgust with the new font, calling it ‘just plain ugly.’ Just like Gap, IKEA also said it was ‘surprised’ by the response. They simply never thought it would be a big deal. The idea that brands are defined by customers is not new and neither does it have anything to do with social media. (Think about 'New Coke' in 1985 and the uproar it created.) But in the age of social media, where it has become easier for customers to instantly voice their opinions, connect with each other and exchange their reviews and comments about you, companies need to be even more mindful of the role customers play in shaping brands and how social media has empowered them more than ever before. Does this mean every company or organization should be crowd sourcing every new initiative/idea/logo redesign? Not necessarily. But the least they should do is to keep customers in the loop, explain their decisions or plans, and ask for suggestions. Just listening to customers can make them feel more valued and better prepared to accept an evolution of a brand they love and are accustomed to. “At Gap brand, our customers have always come first. We’ve been listening to and watching all of the comments this past week. We heard them say over and over again they are passionate about our blue box logo, and they want it back. So we’ve made the decision to do just that – we will bring it back across all channels. My own Gap-like logo, created from http://craplogo.me/. Go ahead, crap your own logo now!